What are the Tongdao Dong Villages? Originally built during the Hongwu Period (1368 - 1398) of the Ming Dynasty, Tongdao Dong Minority Villages is composed of the famed Yutou Dong Minority Village (芋头侗寨), Huangdu Dong Minority Village (皇都侗寨) and other Dong villages along a corridor stretching into Guangxi Province. These villages have been home to the Dong ethnic minority groups for hundreds of years. 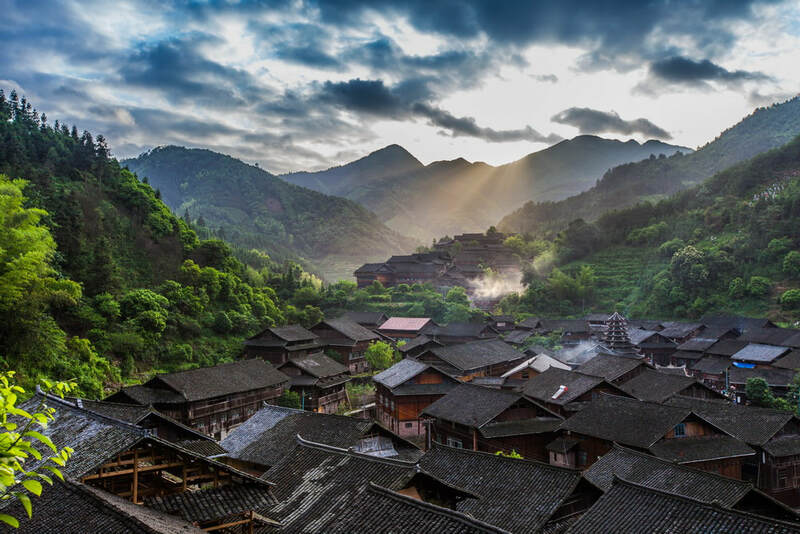 Situated some 90 kilometers north of Longji Rice Terraces, Tongdao Dong Minority Villages are less known to visitors compared to Zhaoxing Dong Minority Villages. Therefore, visitors can experience more authentic Dong customs and tradition in Tongdao. Yutou Dong Minority Village is situated 9 kilometers from Tongdao County. There are 4 drum towers, 3 wind and rain bridges, 2 old wells, a 1.6 kilometers long post road and 78 old houses with high feet. All these buildings in the middle and end Qing Dynasty (1644 - 1912) are well-preserved there. Huangdu Dong Minority Village is made up of Touzhai Village, Panzhai Village, Weizhai Village and Xinzhai Village. It is one of the most complete preserved villages in the among the Dong villages. There are more than 500 buildings with high feet, 4 drum towers and 1 wind and rain bridge in the village. Visitors can appreciate the natural Dong performance in Huangdu Dong Village presenting the rich Dong culture, such as Lusheng Dancing, Pipa Songs, Duoye Dancing and the like. In addition, visitors can enjoy the authentic Dong food not only in the village but also in Yutou Dong Village. The best time to visit Tongdao Dong Minority Villages is from April to October as it is not too hot or too cold during this period of time. As there is no direct bus from Longsheng or Huaihua which is located some 3 hours drive from Tongdao County, there are only a few options. Rent a car from Longji Rice Terraces, Huaihua or Tongdao to Yutou Dong Village or Huangdu Dong Village. This is the quickest and most direct option. Take a flight from Bejing, Guangzhou, Guilin, Nanning, Shanghai, Kunming, Haikou, Shenzhen or Changsha to Huaihua Zhijiang Airport (怀化芷江机场). Then take a train to Tongdao County from Huaihua. Take a direct bus from Tongdao Bus Station (通道汽车站) to Shuangjiang Town. At last, take a taxi or walk to Yutou Dong Village. For Huangdu Dong Minority Village, take a taxi from Shuangjiang Town. Take a train to Huaihua from Wuhan, Beijing, Guiyang, Zhangjiajie or other cities. Then, take a bus from Huaihua South Bus Station (怀化汽车南站) to Tongdao County. Take a direct bus from Tongdao Bus Station (通道汽车站) to Shuangjiang Town. At last, take a taxi or walk to Yutou Dong Village. For Huangdu Dong Minority Village, take a taxi from Shuangjiang Town. Take a train from Nanning, Guilin, Liuzhou, Beihai, Guangzhou or other cities to Sanjiang South Train Station (三江南站). Then, take a direct bus from Sanjiang Hedong Bus Station (三江河东汽车站) to Tongdao County. Take a direct bus from Tongdao Bus Station (通道汽车站) to Shuangjiang Town. At last, take a taxi or walk to Yutou Dong Village. For Huangdu Dong Minority Village, take a taxi from Shuangjiang Town. Opening hours for Huangdu Dong Minority Village, it is open for 24 hours. As at 6th July 2018, it is free to visit Huangdu Dong Minority Village. Interested in visiting the Tongdao Dong Villages on a Tour? Wendy Wei Tours offers a variety of different packaged tours as well as custom tours including the Tongdao Dong Villages, among other attractions and destinations. To find out more, please visit our Tours page or Contact Us directly to find out more.